Usually we preview our posts before hit publish. We want to see how it looks, it was good or still needs to be fixed? Blogger in Draft now supports a new improved preview That feature allows you to see how your post will from actually look to your readers. Note That the preview page does not automatically updated as the contents of the post changes. To make sure the post looks OK after you've done further editing, you can manually refresh the preview page, or click the Preview button again. I like the changes but the whole process is still frustrating me. Hello, I love your BeMagazine template, love the many posts in the different blocks, but would like to change the background color, is there anyway to do this? 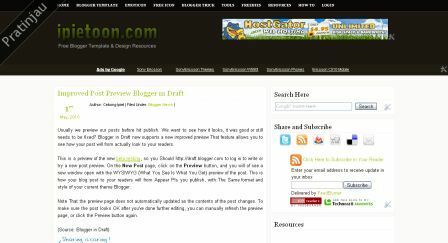 It seemed that the font and colors option on my blogger edit is not visible. thanks for your help. Zap, it's make we can preview template before using. Yeah, I have also seen it and the background code is now easier to modify. Good job. Is the beta testing period over now. Seen it for real today. Could you tell me if you know how to split your header to include a gadget for blogger in draft (just like you've done for the top of your website)? I've tried putting in html codes to do the following, but the header goes to one side, with no gadget showing in the layout page besides the header? Do you have any ideas? Title: Downloading Movie | Download And Watch Free High Quality Movies. Description: Download And Watch Free High Quality Movies All In One Place And Only One Click Away From Unlimited 100% Free Movie Archive. If you are interested, please reply with your site's information and where our link was placed. If you're not interested, your lack of response will indicate your desired action. great sharing miss cebong,.. :) Thanks for your awesome post. Also you may turn your attention on outsourced Microsoft .Net development provided by outsourcing software development company. A lot of thanks for this great tips. Casino webmasters always search for casino affiliate program to increase their revenue income from best casinos or poker rooms. Thank you for sharing with us. Turn your attention on homeowners insurance to help you to save on home policy. I'm glad to know more and read this review. I'm happy to share with insurance instant rates that is provided by best home and auto insurance companies. You may save on cheap homeowners insurance which allow you to obtain cheap affordable policy. I don't want to admit but I think that it is better to double check everything before posting. You don't know how it looks and how it reads until you check it.